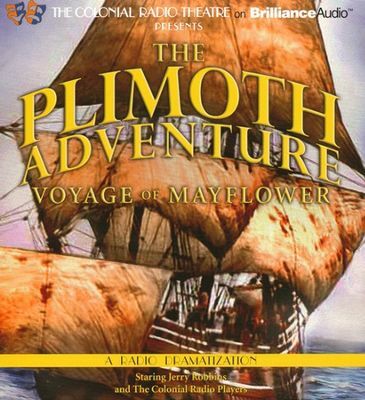 We review The Colonial Radio Theatre's production called The Plimoth Adventure: Voyage of Mayflower in today's episode. This is a historical audio drama that is packed with facts and information, but still entertains. Also in this episode is an interview with Christopher Green from GreenStreams Studio about their brand new audio drama serial entitled Shadows And Daylight. Christopher introduces some of the main characters and shares more behind the scenes info on this series. We also give a mini review for a children's audio drama series called The Tales of Deputy Guppy. It's a jam-packed episode! After listening to The Plimoth Adventure we recommend you listen to The Legend of Squanto from Focus on the Family Radio Theatre. Check out our review in Episode 58. The CRT podcast episode from June 22, 2015 contains some interesting behind the scenes info on The Plimoth Adventure. That info begins at approximately 7:45. Get your copy of The Plimoth Adventure from one of our affiliate partners below. Christopher mentioned his work on these two other shows; The Ceiling Fan and the Jimmy, Sam & Tommy Show. Check out The Tales of Deputy Guppy. Michael reminded us that HisKids.net has changed to KeysForKids.net. Aaron T. suggested we check out Patch The Pirate. Listener Christopher164 interviewed JD on his blog about Porchlight Family Media and ATC!